Ray Poole was born in Gloster Mississippi and started his college football career at North Carolina before later transferring to Mississippi. Poole was a 13th round draft pick of the New York Giants in 1944, but his three year stint in the U.S. Marines put his football career on hold until 1947. 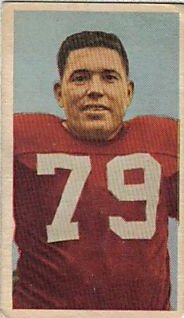 Poole played six years in the NFL for the New York Giants and then played two seasons for the Alouettes (1953-54). Poole was an end and plackekicker for the Als, and finished second in the East in scoring in 1954, behind only his teammate Alex Webster. Ray Poole passed away on April 2, 2008 at the age of 86 from cancer. Individual stats were first kept in the East in 1954. The games played stats are unofficial and taken from the 2005 Montreal Media Guide.